I read them all years ago and only recently discovered they were re-released in a more collector-friendly format. When is the right time to buy 6 books you’ve already read? With a combined price of about $100, the answer is still unclear to me. So, Buy Committee (that’s you), scroll down to the comments to share your thoughts on this possible purchase. 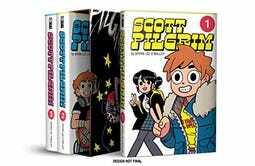 Help nsunshin decide whether to buy this set of graphic novels she’s already read! In these parts, we stan Kim Pine. Our sarcastic queen was, and forever will be, too good for Scott Pilgrim. And buddy, we think you’re too cool to not experience Kim and Envy’s full character arcs, in full color. But hardcover seems like overkill, especially considering these are graphic novels. Go paperback, save cash, and read them again already.